White House press secretary Sarah Huckabee Sanders speaks during the daily press briefing at the White House, May 1, 2018, in Washington. The White House is maintaining that a “clerical error” was the reason it issued a statement accusing Iran of currently operating a clandestine nuclear weapons program. “The typo that you referenced was noticed, immediately corrected and we are focused on moving forward on the safety and security of our country,” responded White House Press Secretary Sarah Huckabee Sanders to a reporter’s question on Tuesday about the statement. “Iran has a robust, clandestine nuclear weapons program that it has tried and failed to hide from the world and from its own people,” read the original statement, implying that Tehran was blatantly violating an important international agreement. The White House soon placed a corrected statement (changing the first ‘has’ to ‘had') on its web site on Monday stating “Iran had a robust, clandestine nuclear weapons program… .” But it did not send the revised document to those who had been sent the original, erroneous declaration. It was the latest of a number of official White House statements and news releases that have contained typographical errors and spelling mistakes. There has been “Air Force Once” on the official schedule in reference to the presidential aircraft and a White House news release touting hopes for a “lasting peach” between Israelis and Palestinians. Shinzo Abe has been referred to as the president, not the prime minister of Japan. And, in a major diplomatic faux pas Xi Jinping’s government in Beijing was deemed the “Republic of China,” which is actually the formal name of Taiwan, regarded as a renegade province by the People's Republic of China. Monday’s original White House statement on the status of Iran’s alleged nuclear weapons program was issued following a presentation by Israeli Prime Minister Benjamin Netanyahu asserting Iran lied when it stated it had never pursued a nuclear weapons program. The Israeli leader said that conclusion was based on tens of thousands of secret Iranian government files Israel obtained. But analysts say Netanyahu’s presentation did not demonstrate that Iran is cheating on the 2015 Joint Comprehensive Plan of Action (JCPOA). Israeli Prime Minister Benjamin Netanyahu presents material on Iranian nuclear weapons development during a press conference in Tel Aviv, April 30, 2018. U.S. President Donald Trump faces a May 12 deadline to continue the suspension of economic sanctions on Iran lifted under the JCPOA. “The deal was made under false pretenses,” Huckabee Sanders told reporters on Tuesday. When sunset provision hits in seven years, Iran will be “able to make a nuclear weapon much quicker than they ever indicated before and that's a big problem,” asserted Huckabee Sanders in response to questions about the U.S. assessment of Netanyahu’s presentation the previous day. Trump and his administration were informed in advance Netanyahu would make a public presentation about the documents. “We certainly supported their announcement and supported their efforts,” said Huckabee Sanders. 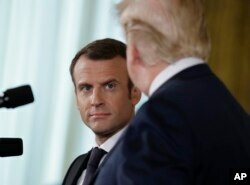 European leaders, including French President Emmanuel Macron and German Chancellor Angela Merkel — who separately visited the White House last week have urged Trump not to imperil the Iran nuclear deal. Iran’s foreign minister, Javad Zarif, said on Twitter on Monday that Trump, in an attempt to nix the deal “is jumping on a rehash of old allegations” already dealt with by International Atomic Energy Agency, the U.N.'s nuclear watchdog. The IAEA states there is no evidence Iran is cheating on the nuclear deal. Some diplomats and analysts fear that a collapse of the JCPOA could lead to a Middle East arms race and increase the possibility of a war between Iran and Israel.